Antlers will abound throughout the Palmetto State as the search for new state record deer antlers gets underway during the S.C. Department of Natural Resources' annual series of measuring sessions. Each year during March, the S.C. Department of Natural Resources (DNR) measures deer antlers throughout the state, with a major effort during the Palmetto Sportsmen's Classic scheduled for March 28-30 at the State Fairgrounds in Columbia. A total of 6,168 sets of white-tailed deer antlers, including 5,936 typical racks and 232 nontypical, are currently ranked on South Carolina's all-time antler records list, according to Charles Ruth, Deer and Wild Turkey Project supervisor for DNR. Minimum scores for state record listing are 125 points for typical antlers and 145 points for nontypical antlers. 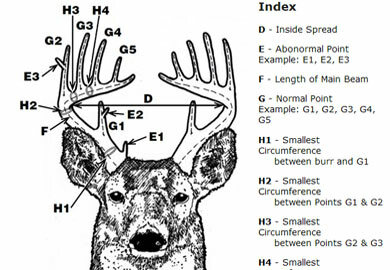 Measurements are based on the Boone and Crockett system. The objectives of the state records list are to recognize outstanding animals and to identify areas that produce quality deer, according to Ruth. This information allows biologists to take a closer look at habitat and deer herd conditions in order to make future management recommendations. Although record deer have been recorded from all counties, Aiken, Anderson, and Orangeburg counties have produced the greatest numbers in the past three to four years. Generally, larger deer are more abundant in areas that have fewer deer, as compared to parts of the state with high deer numbers, according to Ruth. Last year's measuring sessions produced 246 new entries into the South Carolina records list, the second highest number of entries in the last 15 years. Hunters must provide necessary documentation, such as the date and county of the kill, and sign a "fair chase" statement when they bring in a set of antlers for measuring. Antlers in velvet or those that are broken and repaired or antlers separated from the skull plate cannot be officially measured for the state records list. If the lower jawbone of the animal was extracted during taxidermy or otherwise saved, it should be brought to the scoring session so biologists can determine the deer's age. An accurate weight measurement at the time of the kill is also helpful. For additional information on the Antler Records Program visit the DNR website. • Tuesday, March 4, 2-8 p.m., Greenwood, Hunter’s Headquarters, 1845 Calhoun Rd., (864)-223-1911. • Thursday, March 6, 2-8 p.m, Six Mile, Durham’s Grocery, 3210 Walhalla Highway (864) 868-2070. • Monday, March 17, 2-8 p.m, Spartanburg, Academy Sports, 100 Peachwood Centre Dr., (864) 216-8960. • Clemson: At DNR Office, 311 Natural Resources Dr., by appointment only during March (864) 654-1671 ext. 16.